← Ouray County Roads 2 and 4, With Surprises! 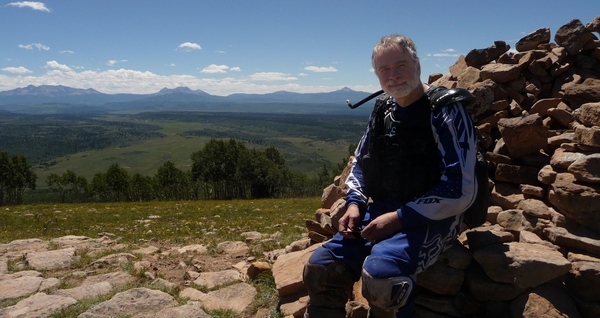 Finally, finally, we had some rain-free days—enough that I wanted to try the trails up on the Uncompahgre Plateau again. 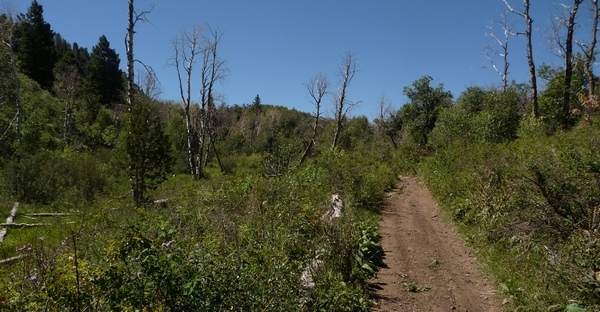 This time I entered from Dave Wood Road and traveled part of the Spring Creek Trail, the length of Dented Door Trail, part of Forest Fence Trail, the length of Rim Road Trail (twice! ), attempted the other end of Forest Fence Trail, and then headed back up to Dave Wood Road using the Spring Creek Canyon Rim Road. I used as my guide the excellent map provided by Kevin Anderson of Planet Motorsports in Montrose. Shown below is a detail from that map, with a red line with arrows outlining the path I took. I provide my GPS track just below that. Here's the relevant section of Kevin Anderson's map. Green trails are "easy" (ha! ), blue trails are intermediate (I stayed away mostly), and pink trails are hard. The orange marks a closed trail, and the yellow lines are the main roads in the area. The red line with arrows represents my general route. Here's my GPS track as taken. Note the going and coming error--up to 300 feet! on the Rim Trail. And I was way up high, not down in a canyon. 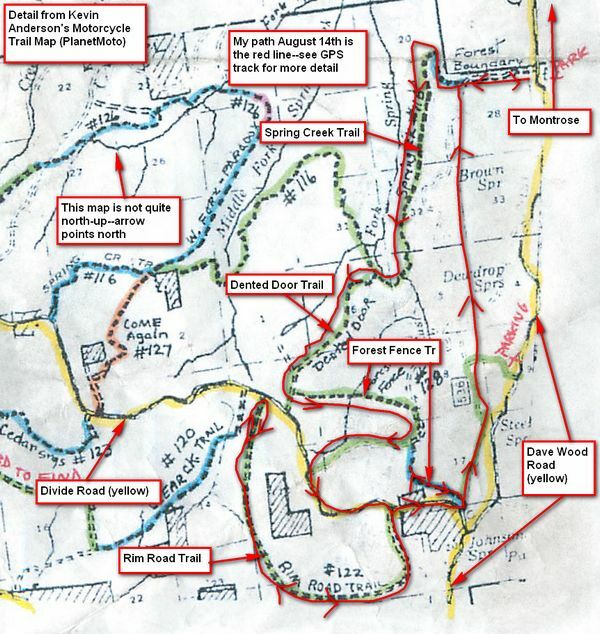 I color-coded sections of the track to indicate which trail I traveled. Here's a sample view along the Spring Creek Trail. Everything is very green because of all the rain we've received this summer. Note this is a double-track trail. I met some folks on ATVs who had stopped for a break. They assured me the trail was pretty straightforward from there. What they didn’t tell me about was that the recent rain had created a pretty long mudhole that couldn’t be avoided. My front tire had essentially no traction, so it was a gamble going through. As it was, I almost made it, but then the front wheel slipped out from under me. The bike didn’t go quite all the way over, but I sure got covered with mud, as did the bike! Oh, well, I got out of there and continued on. I had to ford Spring Creek (not too bad) and then was faced with a decision. If I continued, I’d end up in a place with no “easy” route out, so I opted for the “easy” Dented Door Trail, #117. Dented Door is quite steep, but there wasn’t too much scree and I made it up without incident. Dented Door runs its entire length under forest canopy—very pretty. Here’s the sign—I had just come up Dented Door and the sign is what is seen by someone going down Dented Door. Here's the sign at the south end of Dented Door. Note that the distances are from that point heading north. 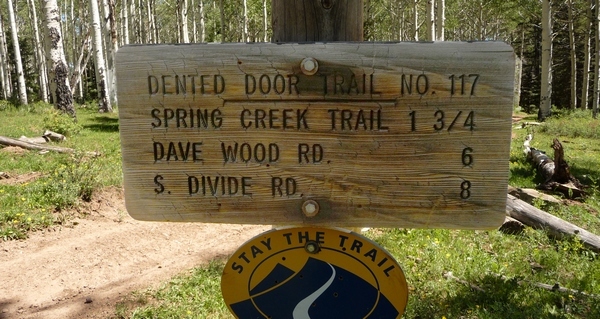 Divide Road is actually not far to the south, so the distance given on the sign is for those traveling down Dented Door, thence continuing west on Spring Creek Trail, and then swinging back to Divide Road. I ran across this sign and reference to Kevin's map showed it was easy. It was, not to mention beautiful. Forest Fence Trail is a single-track trail, meaning on foot, on horseback, or on motorcycle. After the Slanty Bridge Fiasco, I’ve stayed away from single tracks because of how hard it is to get a broken motorcycle out. But this was Saturday, August 14th, and there were other people around, so I headed down the trail. As it was, it was pretty nearly level and decidedly in the beginner+ category. I followed it to a 4WD Forest Service Road and went out to Divide Road, looking for Rim Road Trail, a double-track I traveled last year. Here's the sign along Divide Road for the Rim Road Trail. Go slow because it's easy to drive right past it. An ATV rider took this picture for me. The view is spectacular to the south, overlooking Sanborn Park. That thing that looks like it's coming out of my neck is the drinking tube for water that's in the Ogio vest. I also captured the panorama that’s at the top of this post. Huh? I'm already on Rim Road Trail, and here it tells me the way to continue is—uh—both straight and to the right? As it turns out (Kevin explained this to me afterward) a logging road had been put in that offered an alternative (that’s the way straight ahead). I followed the straight-ahead route out to Divide Road, then came back in on the “old” road and traveled Rim Road Trail in reverse. You’ll note some coming and going discrepancy on the GPS track. It’s actually about 300 feet, which surprised me because I wasn’t in a canyon but up on a high spot. The moral is you can’t trust your GPS’s own estimate of its error. From there I traveled down Divide Road (west) and encountered the other end of the Forest Fence Trail. I followed it until I got to the steep, scree-strewn section. I went down this a little ways, only to discover it went down a whole bunch more. Fortunately I was in a place where I could turn around easily. 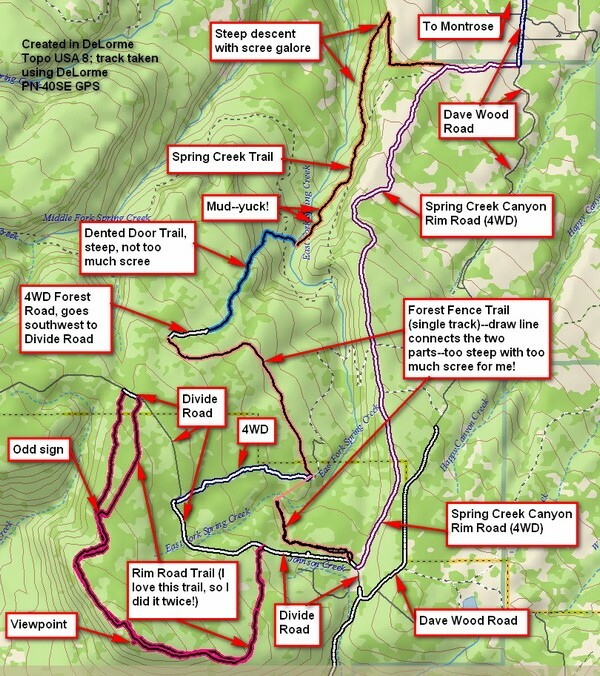 Thence to Divide Road and up the Spring Creek Canyon Rim Road, which is a popular 4WD road, and home. Thanks Dave. These trails will be kind of in my back yard this summer. Looking forward to checking them out.